‘Twas the week before Christmas and — the 2018 harvest is a wrap! It was a mildly warm fall season which allowed for some extended hang time for the fruit that we harvested. Hanging longer on the vine, the grapes build sugar and flavor which makes for a more delicious wine. But it’s a balancing act, knowing when to pick the fruit so that wine is rich in color and flavor and structure, but not so ripe that the sugar levels deliver high alcohol wines that are short on acidity. We want all of our wines to show a bright and beautiful balance of both fruit and acidity. We’re looking forward to the early release of our white wines while our reds will age in oak barrels for, at least, 14-16 months. The 2018 vintage promises to be remarkable! My kids have made it through another harvest and are actually proving themselves valuable in the winery. Charlotte seems to have an affinity for wine. She gets it and is quickly grasping the art and science of winemaking. Theresa-Noelle’s and Buddy’s talents seem to be geared more toward keeping the cellar clean and tidy. No less important. A messy winery can make for messy wines. The past few weeks have been particularly busy as we wound down harvest and launched our popup tasting room at the Santa Barbara Holiday Night Market in the former Macy’s building on State Street. The Night Market opened on Friday November 23rd and runs Thursdays through Sundays from 4 – 10 pm until December 29th. I’ve been sharing pouring duties with our Cellar Master, Trevor Bethke, and Brand Manager, Jamie Edlin. The Market is festive with popup wine and beer tasting rooms, eateries, specialty retailers, arts, crafts, music and more. It’s the best party in town! Please stop by and taste our current releases. We’d love to see you! Our tasting room in Buellton will reopen in January — by appointment only. And we’ll be pouring our wines at the Garagiste Wine Festival at the Veterans Memorial Hall in Solvang on Saturday, February 9, 2019. Hope to see you one place or the other in the New Year. Summer has started and it looks like the vines are cheering it on as they reach for the sky and the sun’s rays. Much of my time right now is spent at the different vineyards where we source our grapes to be sure that our vines are trained to expose the fruiting zones. Though we don’t own “our” vineyards, only contract with them, I’m involved in the wine growing as well as the winemaking. The fruiting zone is where the grapes ripen and it’s my job to manage how the vines are pruned and positioned so that the fruit flourishes. Good fruit means good wine. 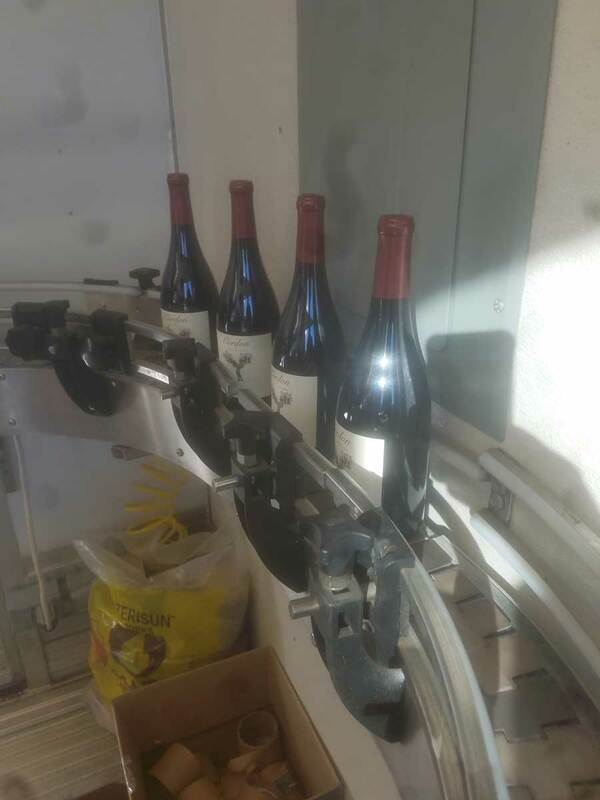 In the winery, we’re bottling some of the 2017 wines. We just released our first rosé. Cuvée Rosé 2017 is made up of 90% Syrah and 10% Grenache from Paradise Road and Vogelzang vineyards in the Santa Ynez Valley AVA. The back label reads “J’aime Rosé,” a play on Jamie’s Rosé, in honor of our brand manager Jamie, a devotee of all things rosé. She worked with me on the blending and gave the finished wine her highest blessing. Next – we’re gearing up to bottle our Cuvée Blanc 246, a blend of Marsanne, Rousanne and Viognier. The wine should be released in late August. My kids are finally showing more interest in the winery. Credit goes to Charlotte in helping me hand-label the Rosé. And all of the kids have added their art works to a number of barrels. Nice touch! 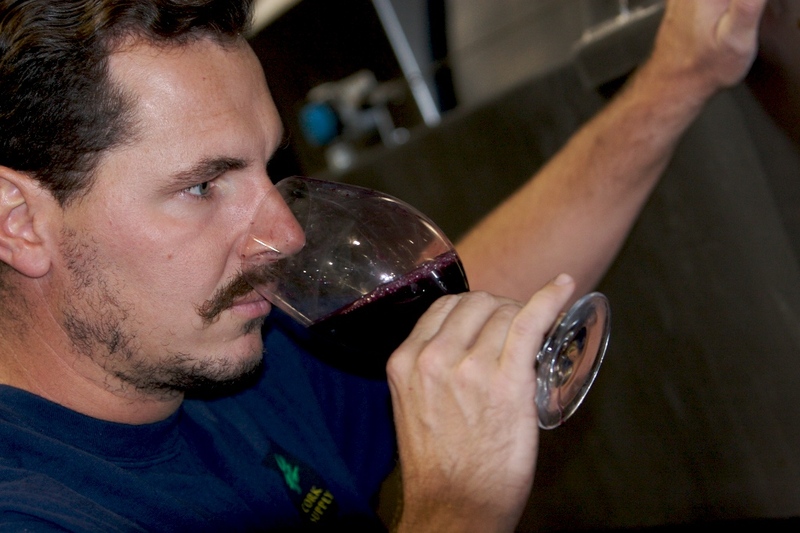 With Jamie now living in the Santa Ynez Valley just miles from the winery, the plan is to take the Cordon brand to the next level, eventually opening the tasting room on a regular basis and starting up a series of winepairing dinners with various chefs at the winery, as well as with local restaurants. We recently hosted an evening of tastings – both wine and small plates – at Chef David Cecchini’s newly opened Cecchetti, a wine bar and mercato in Solvang. The first in what we hope will be many. And we’ve started a monthly series of potluck industry lunches at the winery, including other winemakers, restaurateurs, chefs, restaurateurs, bartenders, wine and food media, and others in the trade. My assistant winemaker Trevor along with Jamie are growing that project with the objective of creating a tight industry community in the Santa Ynez Valley. As winemakers, we all may be competing with each other on a certain level, but we’re also cooperative with each other and all share the goal of shining a bright light on Santa Barbara County Wine Country. Our tasting room is open by appointment. Just let us know when you’re coming to the Valley and we’ll be more than happy to open some bottles and taste you through the current releases. If you happen to be here on one of our potluck lunch days, there’s a good chance that we can even make room for you at the table. We wrapped up the 2017 harvest just in time for Thanksgiving and we’re bottling wines from the 2016 vintage today just in time to open some bottles for the New Year. All good reasons for celebrating the holidays as we put to bed a season of hard work so that we can focus now on Friends and Family! The 2017 vintage is showing great promise. In spite of the Whittier Fire in July, we had ideal weather conditions this past year – rain, cool weather, and well-timed heat spikes – pushing varietals to optimum ripeness. As you know, we are dedicated to Santa Barbara County AVAs. We’re very much in touch with the nuances of the various microclimates across this region. I carefully choose the vineyards from which I source my fruit based on the highest quality and varietal expression. We are now working with Fiddlestix Vineyard and John Sebastiano in the Santa Rita Hills AVA; Goodchild, Gold Coast and Bien Nacido vineyards in the Santa Maria Valley AVA; Vogelzang, Dierberg, and Grimm’s Bluff vineyards in Happy Canyon of Santa Barbara AVA; Area 51, Bella Cavalli, and Gunter Vernon vineyards in the Santa Ynez Valley AVA; and White Hawk Vineyard in the Los Alamos area of Santa Barbara County. I’m leaving for the winery shortly to bottle some of those wines from last year’s harvest, including the 2016 “Les Jumeaux” Pinot Noir and the 2016 White Hawk Syrah, our only single vineyard designate. We’re also introducing “Cuvée Rouge 246,” a Rhône-inspired blend of Grenache, Syrah and Mourvedre. We’re tagging the wine “246” in honor of Highway 246 that runs the course of the Santa Ynez Valley from west to east. We’ll be debuting a white Rhône-style blend, “Cuvée Blanc 246,” in the spring along with “J’aime” Rosé, also Rhône inspired. There’s always something going on at the winery. We’re keeping busy. Thanks goes to my assistant winemaker, Trevor Bethke. He does a great job! My kids did a pretty fine job assisting us during harvest this year. They’re finally coming of age when I can actually put them to work. I mean — they’re actually being productive. Big cheers to Theresa-Noelle, Charlotte, and Buddy. We should be re-opening the tasting room in the Spring, a project headed by Jamie. But don’t stand on ceremony. If you’re planning to be in the Santa Ynez Valley before then, let me know when and I’ll gladly meet you at the winery. With the Santa Ana winds blowing dry and fanning the Thomas Fire flames through Ventura and Santa Barbara counties right now, it’s hard to imagine a rainy winter, but one can hope. Rain in the Valley typically means snow in the mountains and it’s time to teach the kids to ski as reward for jobs well-done. Enjoy the happiest of holidays! * Our heartfelt thanks to the fire crews that kept the flames from our homes, our wineries and our vineyards this past July – and our appreciation continues as they fight the Thomas Fire now blazing in the Central Coast. Spring has come and gone and we are now slightly past summer solstice. Due to the nitrogen-rich and salt-free rains of this past winter, the vines are growing heavy with fruit. We have completed shoot thinning and the vines are better balanced. Leaf pulling is finished so that sunlight and fresh air can reach the vines easier. And we’ve adjusted the trellis catch wires for optimum fruit concentration. Ready to move forward toward harvest! Good thing the kids are off for the summer. Good help is hard to find these days. As I write this newsletter, our heroic firefighters are still battling the Whittier Fire in the Los Padres forest started 10 days ago by a car fire off of Highway 154. The hot weather certainly hasn’t helped the situation. Thus far, more than 18,000 acres have burned. We’re lucky that the fire is some distance from our vineyards. Ash and smoke taint can have a devastating effect on the quality of our fruit. We’ve added a new vineyard this year for our 2017 “L’Inox” Sauvignon Blanc program. Grimm’s Bluff in the Happy Canyon of Santa Barbara AVA is a young vineyard with a lot of potential. We will be working with two clones of Sauvignon Blanc, Musqué and Clone 1. The Musqué clone is known for its aromatics and Clone 1, found at Chateau D’Yquem, my grandfather’s favorite white wine, is valued for its body, grassiness and citrus attributes. 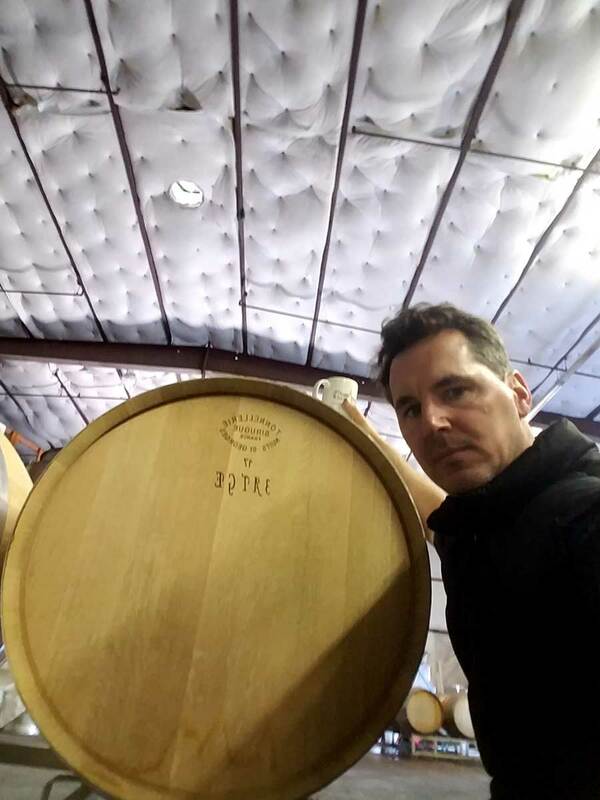 Our 2016 “Les Jumeaux” Pinot Noir, 2015 White Hawk Syrah, and new-to-our-portfolio 2016 “Cuvée Rouge 246” Rhone-inspired blend are still aging gracefully in barrel where they will finally be for 18-24 months before bottling. Samplings from the barrel show great promise. Delicious! And we’re less than a month away from bottling our 2016 “L’Or de Salomon Pico” Chardonnay from the Santa Maria Valley AVA. Let us know if you’d like to host a private Cordon pairing dinner in your home. We travel within the state of California. With wine and a chef and a grill and the protein(s) of your choice. Please contact Jamie at [email protected] for more information. On the subject of winepairings, we’re pairing our wines with Wood & Vine’s cooking for a Vine To Vine Dinner tomorrow night in Hollywood, tomorrow being July 19th. Please go to our Event page for more information. I believe that we still have a few empty seats. One of them undoubtedly has your name on it. Wine Talk 2017 — Happy New Year! The 2016 harvest is now history! Last summer in Santa Barbara County was very mild with a couple of noticeable heat spikes, enabling most grape varietals a slow ripening process leading to optimal maturity for harvesting. By the time we put the wines to bed in barrel or tank for maturation, the aromas and flavors were already showing a certain density and complexity. Besides my Santa Barbara County-born Sauvignon Blanc, Chardonnay, Pinot Noir, and Syrah, I’m introducing a couple of Rhône-inspired blends this year, a red blend and a white, both of which promise to be rich and luxurious. I’m going with the moniker “Cuveé 246” in line with the fact that I work with a number of vineyards along Highway 246 through the Santa Rita Hills to Happy Canyon. If this past month offers any hint of what’s to come in the way of precipitation, we just might get the rain that we so badly need this year. Even though we drip irrigate, the vines need those chilly post rain days to push them into dormancy. Vines that stay dormant longer tend to have more acidity, leading to length and balance. And that’s what I want. And so I’ve got my children working on a rain dance. Theresa-Noelle is now 9 and the twins, Charlotte and Buddy, are 6. They’re starting to understand what it is to run a family winery and I think that they’re rather proud of it. 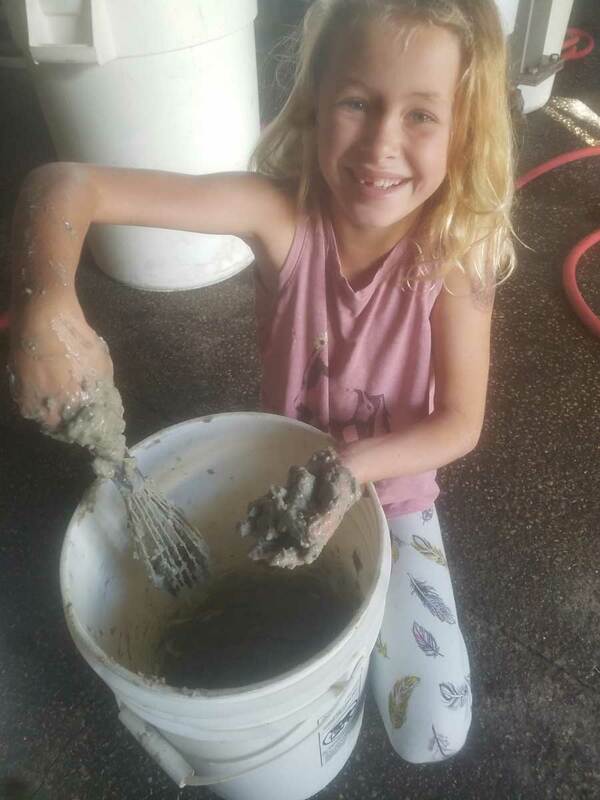 Whereas the winery used to serve as their playground, I finally put the the kids to work during this past harvest pulling little green stems called “jacks” out of the fermenters. This will insure that your wine is tasty as always. We’re going for the “yum” factor. We had a great 2016 with the support of our marketing-brand manager, brokers, and distribution arm in the Central Coast, Southern California, and Nevada territories, such a good year that we quickly sold through all of our wines, leaving our customers wanting for more. That’s the good news – and the not so good news. Gearing up for the new year, we are slightly upping production and, in fact, bottled our 2016 Sauvignon Blanc, our 2015 Chardonnay, and our 2015 Pinot Noir in mid-December. And we’re just about to release the new vintages. Our White Hawk Syrah and the new “246” blends will follow. Along with Rob Dafoe and Emily Rosendahl of Rake wines, I opened a tasting room in my winery in late spring 2016. The Easy Street Wine Collective is located at 90 Easy Street in Buellton. We’re currently open on Saturdays and Sundays from 11:00 am to 5:30 pm. If you’re planning to visit during the week, please contact us for a tasting and we’ll do our best to accommodate you. Our plans are always a bit more ambitious than time permits, but we’re hoping to roll out a series of winepairing dinners with visiting chefs this year along with other wine-related events at the winery. We’ll keep you current on our calendar of events with the hope that you’ll join us. Meanwhile, we wish you and yours a Happy New Year – one that unfolds with promise and peace and always good wine. This is my first Newsletter. Or call it a “blog.” I’ll, hopefully, find something interesting to say a few times a year so that I can keep in touch with you. My 2016 releases are crafted from grapes that very naturally call Santa Barbara County home. I don’t typically make wine from single vineyards. I make what I call “Appellation Wines” that are focused on the AVAs from where the grapes are farmed. Certain grapes do better than others in specific AVAs and that’s what captures my attention – the microclimates and terroirs of various appellations. My Sauvignon Blanc comes from the Happy Canyon AVA. My Chardonnay was born in the Santa Maria Valley AVA. My Pinot Noir is from the Santa Rita Hills AVA and my Syrah from Santa Barbara County AVA. I’m clearly Santa Barbara-centric these days. I may start producing some blends in the future. I would call them my “246 blends.” I’m considered a “HWY 246” winemaker due to the fact that I work within many of the appellations and with specific vineyards along the Highway which runs east to west from Lompoc to Happy Canyon along California’s Central Coast. I drive Highway 246 every day and feel very in touch with all of the nuances and variations of this growing region, my growing region. The farm-to-table movement really shouldn’t be considered a movement. It only makes common sense to know where your foods and wines are coming from. I have relationships with all of the growers that I work with and I’d like to believe that the people who follow my wines do so in part because of those relationships. I like to keep it very up close and personal. 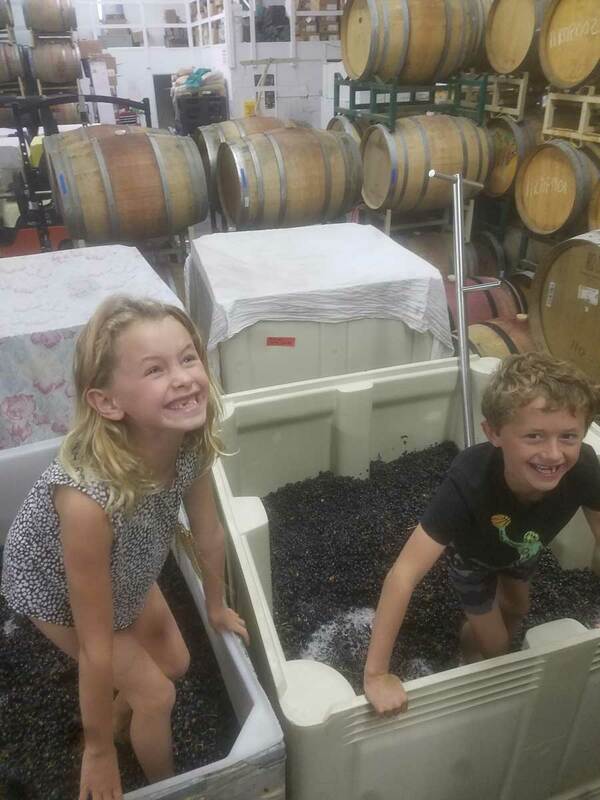 My kids help me in the winery on occasion or, better said, when they’re not getting in my way. I hope to expose them to everything this world has to offer so that they make smart decisions in their lives. I took my five year old son Buddy to Belgium and France this past summer. We saw the reenactment of the 19th century Battle of Waterloo on the original battlefield in Waterloo, Belgium. Buddy was mesmerized. My father, who lives in Belgium, and Buddy accompanied me to our cooperage, Francois Frères, in Burgundy, France. We tasted some great Burgundy wines. Buddy dipped his finger in my glass, the best way to introduce a child to wine. I think he liked it. He certainly slept well in the car on the way home. Tasting! People should sample wines with every opportunity they have. Wines are complex. Wines are interesting. Wines are subjective. Everyone has their own taste. The more you explore wine, the more confident you’ll become about wines. Confidence comes with experience. Please come and experience our wines at our recently opened tasting room. The Easy Street Wine Collective “softly” opened in May of 2016 at 90 Easy Street in the Industrial District of Buellton in the Santa Ynez Valley of California. If we have your name and email address on our mailing list, we’ll let you know the date of our Grand Opening later this summer. I hope that you’ll join us.